AMED’s program supervisor Kanda giving an overview of the initiative. 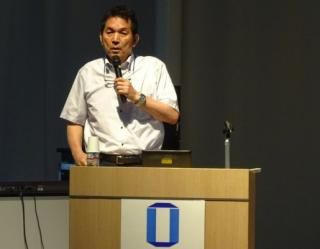 Director and Specially Appointed Professor Sumio Shinoda introducing the activities of the Collaborative Research Center of Okayama University for Infectious Diseases. Dean Kouichi Morita of the Nagasaki University Institute of Tropical Medicine giving his talk on efforts being made in Vietnam. Yoichi Kurebayashi Executive Officer and Director of the Department of Innovative Drug Discovery and Development explaining AMED’s support for innovative drug discovery. Okayama University has been selected to participate in the Japan Agency for Medical Research and Development (AMED)’s ‘Japan Initiative for Global Research Network on Infectious Diseases’ for the academic year 2015. 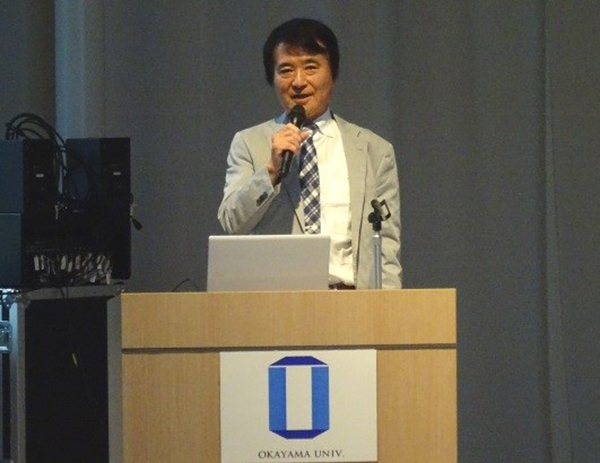 A kickoff symposium for the initiative, hosted by the Okayama University Research Core for Control of Infectious Diseases, was held in the Junko Fukutake Hall on the Shikata Campus of Okayama University on July 16. The aim of the symposium was to introduce the activities of the initiative, and hold an exchange of views on the project’s future development. 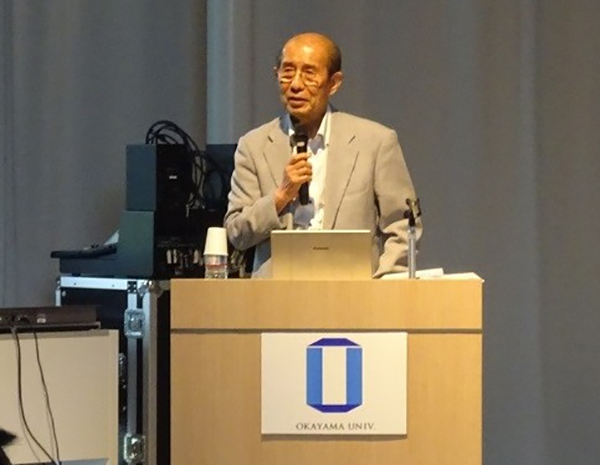 In his greeting to the symposium, president Kiyoshi Morita stated: “We will further strengthen the Collaborative Research Center of Okayama University for Infectious Diseases, which has been active as a research base for many years in the Indian city of Kolkata (Calcutta). We wish to contribute to the suppression of infectious diseases through a fusion of Okayama University’s basic research prowess and Okayama University Hospital’s fine clinical capabilities.” In the greetings from the guests of honor, AMED program supervisor Tadahito Kanda and the Ministry of Education, Culture, Sports, Science and Technology (MEXT)’s director for Advanced Medical Science, Hideyuki Kobayashi, expressed their expectations for Okayama University while introducing the objectives and achievements of the initiative. The director of the Collaborative Research Center of Okayama University for Infectious Diseases, Specially Appointed Professor Sumio Shinoda, introduced a project to control diarrhea infections, which has been carried out jointly with the Japan International Cooperation Agency (JICA). Professor Shinichi Miyoshi of Okayama University Graduate School of Medicine, Dentistry and Pharmaceutical Sciences gave a talk on international collaborative research into the prevention, diagnosis and pharmaceutical development for diarrhea infections at their research base in India. 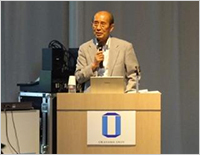 Dean Kouichi Morita of the Nagasaki University Institute of Tropical Medicine, gave an explanation of infectious disease control, including infectious diseases mediated by mosquitoes, being carried out at the Institute’s research station in Vietnam. 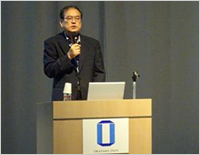 In addition, Yoichi Kurebayashi, executive officer and director of AMED’s Department of Innovative Drug Discovery and Development, introduced AMED’s ongoing drug development program and the collaborative arrangements for the Initiative. This year marks the 30th anniversary of the conclusion of the Japan-India Agreement on Cooperation in the Field of Science and Technology, and Okayama University will also be deepening coordination for the strengthening and promotion of international research capabilities in these key research areas. Further information including the Okayama University- NICED 2007 MEXT program Founding Research Centers for Emerging and Reemerging Infectious Diseases can be found below.